What troubles me about the “debate” about legalization of cannabis is that the pro-pot side seems to make claims about various medical benefits that appear to be only tenuously supported by real scientific evidence–in fact, some of the claims are downright dangerous. The reasons for doing this is probably, though I can only speculate, to make it appear that marijuana is some miracle product, so let’s speed up the legalization of it. It’s like the Food Babe telling us that kale is the miracle food, except that kale isn’t illegal. It does taste awful (but not the point). On the internet, you will find numerous memes, blog posts, and even mainstream articles that claim that smoking pot, eating pot, rubbing hemp oil (which is manufactured from the seeds of Cannabis plants that don’t contain much THC, or tetrahydrocannabinol, the active hallucinogenic agent of cannabis), or doing something with all or a part of a cannabis plant will cure or prevent some disease, mostly, but not exclusively, cancers. Famously, marijuana has been used as an anti-emitic to ameliorate or mitigate nausea and vomiting after radiotherapy and chemotherapy in cancer treatment. In fact, marijuana has been smuggled into some cancer wards since the late 1930’s. 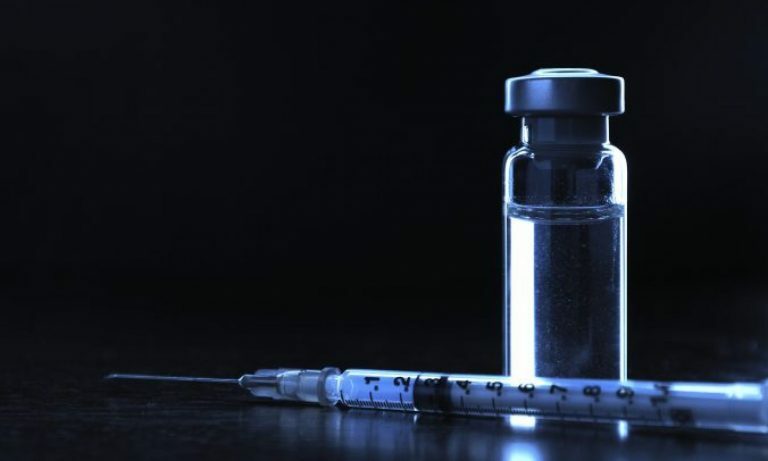 Unfortunately, even with this particular use of the drug, there have been negative results in some well designed clinical trials and positive results in some others. The highly variable result may result from difficult trial design to bias to a huge dose of the placebo effect, an effect that many scientists have concluded is overrated. 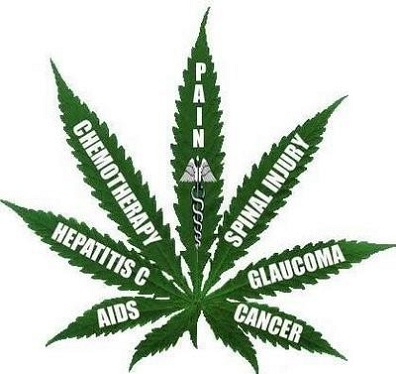 But even as an anti-emitic, marijuana has no curative power, it’s a palliative treatment for the nasty side effects of chemotherapy and radiotherapy in the treatment of cancer. Since weight loss and wasting are side-effects of cancer treatments, any medication that can prevent the nausea and vomiting can lead to better medical and lifestyle outcomes in cancer treatment. If there is a real clinical difference between those who use marijuana vs. those who don’t for cancer therapy effects, we need real clinical trials that show the difference. Moreover, to do this type of clinical research correctly we require real dosage information, that is, at what dose do we get the best effect. This would be a landmark study, and until then, all we have are anecdotes, albeit emotional ones. Is there any evidence out there that actual cannabis or its byproducts have any effect on cancers or neurological conditions? Before we start, let’s remember that there are 100 to over 200 different types of cancer (the actual number depends on how some researchers subdivide some cancer types) in humans. And each of these different cancers have different pathophysiologies, different genetics, different prognoses, different causes, and different treatments. In other words, it is not one singular disease which might someday have one unified course of treatment. If I could make a recommendation, always be skeptical when someone makes some claim that “XYZ cures or prevents cancer”, because that’s going to be nearly impossible. Every cancer is so different with such different physiology, there is just never going to be a magic pill. And if a cancer has become metastatic, there is simply no way one treatment can work. And preventing cancer becomes more problematic. It usually takes numerous, up to 10, independent mutations of a cell before it can become a growing, metastatic cancer. Each mutation is selected, as in natural selection, because it provides some benefit to the cancer cell, such as causing blood vessels to supply the cells for nutrition and oxygen, or the ability to divide rapidly, whatever the feature is. They aren’t “naturally” a part of the cell, but caused by a mutation. And these mutations are more or less random, and they can’t be prevented by anything special. You can’t down 500 Vitamin C tablets and expect it to block these rare mutations. I don’t have evidence there’s a pink unicorn walking on Mars, but I’m fairly certain of it. So don’t say “no one has never researched smoking weed on reduced brain cancer, so you don’t know if it does.” Nope, I don’t do those kind of arguments. If there is no evidence that smoking cannabis cures brain cancer, we cannot claim that it cures brain cancer. If I am certain that unicorns don’t exist, and that they’re are no pink versions of unicorns, and that there’s not enough atmosphere on Mars to allow the survival of unicorns, then we have enough biological plausibility (or lack thereof) to state that there are no pink unicorns on Mars. Of course, someone will then state that there’s a secret cavern that has is filled with oxygen and organic, GMO-free foods for a hidden population of pink unicorns. There’s no winning when it comes to the argument from ignorance. The first step I take before I investigate any internet claim is to examine the quality of the evidence supporting the claim. Mostly, I want to find systematic reviews of clinical research to give me the best possible evidence of whether a potential therapy has actual clinical usefulness. A search of the Cochrane Reviews, which can be a useful tool in finding a scientific consensus in a new therapy, shows not one systematic review of THC or cannabis in cancer therapy, although there are some that look at mental disorders (which is still important). There are numerous reasons why Cochrane may not have a review about a procedure or drug, mainly because there just aren’t enough clinical studies of high enough quality to roll up into a systematic review. That’s a clue, but it’s more a lack of evidence rather they are overwhelmed by solid evidence. Let’s see what’s going on recently. Remember, if some article was published 10 years ago, and there’s not one single follow-up study, it’s dead on the vine, meaning that no one was able to repeat the data. No one was able to move it from some cell-culture or animal model to a human clinical trial. This happens all of the time, because failure in oncology drugs is the norm. Remember, if you find a study published in 1995, and it’s never cited or never repeated, that’s probably because it couldn’t be repeated. That’s how science works. First, we should review some of the better studies in marijuana research on cancer. A couple of points: first, most of the research is primary, and has yet to be repeated widely, and second, there is little or no clinical evidence which can be used in systematic reviews of cannabis, which would form the basis of evidence based medicine of using cannabis in a clinical setting. Breast cancer. Again. Let’s say that we actually can gather evidence that marijuana has an effect on breast cancer. First, we need to determine how much THC actually would kill most breast cancer cells. In one study, the researchers determined that it would take a concentration of cannabinoids of approximately 10 µmol/L to cause the death breast cancer cells in cell culture. This converts to around 3.14mg/L of THC. So, you’d have to assume that to kill any breast cancer cells, you’d need at least a blood level of 3.14 mg/L to achieve breast cancer cell death. So how close to that 3.14 mg/L can we get by just smoking a joint or two? According to research, smoking one joint will give you a blood level of THC of around 1.3-6.4 ng/mL serum, or about .00013-.00064 mg/L. In other words, to get an anti-cancer effect, you need to light up around 1000 joints per day. Yes every single day until every single breast cancer cell would die. Of course, your lungs couldn’t tolerate that, nor probably your ability to function in any “normal” manner. Of course, you could consume this in other ways, for example ingesting it, but again, you’d need to eat more than 1000 joints (because less digestion is less efficient in absorbing THC than the lungs, which is why it is smoked). And these levels may be more generally toxic to body, in effect killing you. If we ever uncover clinical evidence that marijuana “cures” breast cancer, Big Pharma will spend the money researching which molecule is actually responsible, the over all toxic dose, the amount necessary to kill the cancer cells, and how to deliver it. And then they will patent it, because they did all the hard work, and they will get $10,000 a dose (just a guess). So, let’s be clear. Smoking a couple of joints is NOT going to cure your breast cancer. Of course, cancer isn’t the only place where research is ongoing. If you read the story regarding CNN’s chief medical correspondent, Dr. Sanjay Gupta, who claimed he changed his mind about marijuana, you’d know he was also convinced that marijuana had some great potential in mental health. But is there really in high quality evidence? Epilepsy. Another Cochrane Review examined the effect of smoking cannabis on epilepsy (an anecdote shared by Dr. Gupta). The authors found “no reliable conclusions can be drawn at present regarding the efficacy of cannabinoids as a treatment for epilepsy.” This means what it means, that a thorough systematic review of clinical research currently available on marijuana’s effects on epilepsy has shown nothing. Sure, maybe better trials will show it’s quite efficacious, but remember, that doesn’t mean it will be so. And physicians treating epilepsy need to stick with evidence based medicine. I have heard the Strawman Arguments that Big Pharma, the FDA, the National Cancer Institute (if the cannabis supporters know it exists), and the US Government suppress all the research that show how great cannabis is for cancer and other clinical indications because those groups don’t want pot to be legal. As amusing as that argument might be (and it’s a fairly bad one), if cannabis or any of its components actually could show efficacy against any of the 200 or so cancers, Big Pharma would be all over it. Because, they would not be selling joints, they would be isolating the active ingredient, defining the exact dose, determining how to deliver it to the local cancer site in the body, funding clinical trials, filing documentation with the FDA, then getting it into physician’s hands. This is not an easy process, but it would be a profitable one if it worked. Big Pharma and the National Cancer Institute are looking at everything, and they ignore nothing for potential in treating cancers. If cannabis works (and it might), they are all over it. Big Pharma is providing a lot of the funding for it. There are known risks to individuals who smoke marijuana. This is uniformly ignored by everyone, and there are even false claims that somehow smoking cannabis is safer than smoking other plants, like cigarettes. Part of the belief lies in the Appeal to Nature fallacy, which, in this case, implies that somehow marijuana is purer and healthier. The environmental damage from the poisons used to grow marijuana (which will, in fact, remain on the plant, and make up part of the what is inhaled) are legendary. On the other hand, marijuana smoke deposits 4X as much tar in the lungs as do cigarettes. Although this may not be carcinogenic, tar can lead to the same non-cancer long-term damage to the lungs as do tobacco products–emphysema, bronchitis and lung infections. In other words, if we’re looking at marijuana as a medical product, it’s risks are known and real. If I were a medical researcher (oh wait…. ), and if marijuana had a real value medically (say it did cure breast cancer), smoking it would be the worst possible way to deliver the drug to the body. As I mentioned above, I would isolate the compound in marijuana that actually killed breast cancer cells, figure out a way to carry that molecule to the target site at the appropriate dose, and avoid harming the lungs. That’s how a real medical product works. …yet there is no rigorous scientific evidence that marijuana effectively treats the symptoms of many of the illnesses for which states have authorized its use. Instead, experts say, lawmakers and the authors of public referendums have acted largely on the basis of animal studies and heart-wrenching anecdotes. The results have sometimes confounded doctors and researchers. So, does marijuana work to prevent or cure cancer? There is little evidence that it prevents cancer and a little evidence that it can cure cancer. But these are very limited in vivo and animal studies, very preliminary and not in controlled clinical trials. Just to give a little perspective, less than 8% (pdf) of oncology drugs that enter clinical trials actually end up being approved for use in humans. The failure rate is rather large because the efficacy is generally measured in small amounts for many types of cancers. There’s no doubt that what is driving the legalization of medical marijuana in so many states has far more to do with politics than with science. Right now, for all but a handful of conditions, the evidence is slim to nonexistent that cannabis has any use as a medicine, and those conditions, such as CINV and chronic pain, can often be treated more reliably with purified or synthesized active components. Moreover, for one condition for which there is reasonably good evidence for the efficacy of cannabis and/or cannabinoids, namely chronic pain, politicians are reluctant to approve medical marijuana. This is the same thing with a lot of science in this country. Political expediency trumps real scientific research. Anthropogenic global warming, which is backed by a wealth of evidence, is rejected because it’s a “liberal conspiracy” or some such nonsense. Well, now politicians want to allow marijuana because of medical benefits, almost all of which are unsupported by real scientific evidence, while ignoring some of the known risks of smoking the drug. If politicians want to make marijuana legal, do so because it’s a recreational drug, not unlike alcohol. The world of medical marijuana is using the same weak evidence, the same ignorance of risks, and the same logical fallacies you hear from those who push “natural” herbs or supplements. And the more we look the more we find that there’s nothing there. We need to separate recreational use of marijuana from medical use. They are not the same, and one shouldn’t support the other. Marijuana prevents nausea in cancer treatment patients–maybe, maybe not. No solid research in the area. Marijuana can treat neurological conditions–not really, but some isolated cannabinoids may help ameliorate some symptoms of some conditions. If you want to smoke marijuana (or eat it in a brownie–not sure that’s a thing anymore, it was when I was in college) because it’s relaxing, or you need to blow off steam after a tough day, fine. Go for it. I absolutely do not understand why this usage is illegal. It’s costly to society. And banning it provides no benefit to society. On the other hand, I find most, if not all, of the medical claims made about marijuana to be laughable. The evidence is just so weak or non-existent, I actually have no clue why it’s part of the discourse, but then again people deny evolution, and we end up arguing that. Yes, there are bits and pieces of intriguing evidence that a component of marijuana may have some benefits to human health. But we’re a long ways from testing that with real clinical trials, then getting it to market. And trust me, when someday we have found some real clinically significant uses, it’s not going to be sold as a “joint.” It’s going to be developed into some sort of medical delivery formulation (like a pill or injectable solution) that gets the purified pharmacologically relevant compound to the physiological site where it would work. That’s how real medical science works. I have a policy of open commenting and dissent to my articles. I only delete spam, racism, and just random nonsense. Please comment here if you wish, because I know everyone has an opinion on pot. You can say that I’m full of equine manure, but you better have peer-reviewed evidence. 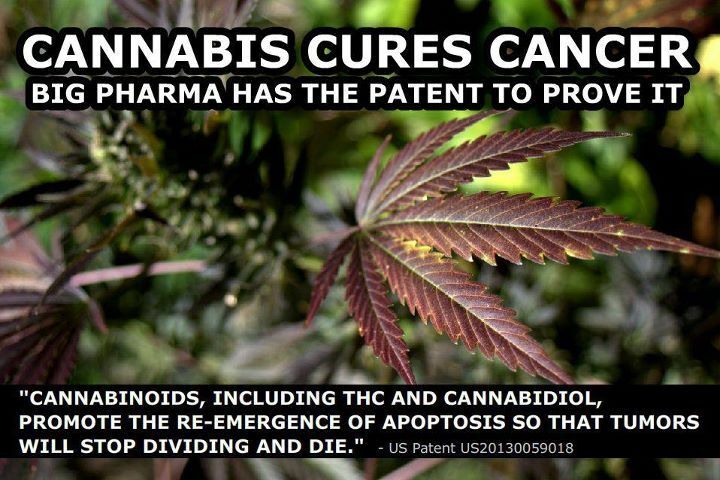 There is a US Patent that has, as one of its statements, “This invention relates to the use of phytocannabinoids, either in an isolated form or in the form of a botanical drug substance (BDS), as a prophylactic or in the treatment of cancer.” There are memes that state that Big Pharma knows that cannabinoids cure cancer or else they wouldn’t have patented it. However, patents do not represent peer-reviewed science, and merely conjecture on the part of the patent holder, so that they may potentially block anyone from manufacturing the drug for the use that it claims. There is no evidence that this cannabinoid has any real potential of doing anything until such time that there are randomized clinical trials that support these claims. So, don’t mention patents. They mean absolutely nothing, because drug companies continuously file patents when they even think something might do something. Most drug patents never end up being drugs. Let me remind you that the quality of the source used matters, and cherry picking primary studies to support a Confirmation Bias is not not how real skepticism works. Remember, if some article was published 10 years ago, and there’s not one single follow-up study, it’s dead on the vine, meaning that no one was able to repeat the data. Do not accuse me of cherry-picking. There are lots of published articles out there using THC or something else in mice or cells. That’s not clinical evidence, which is the gold standard. Let me repeat an old adage–we have cured cancer over 100,000 times in mice. Because those models just tell us maybe it works. It never tells us that it does work. If you’re going to make a lame Big Pharma Shill Gambit to invent some claim that I, and my friends, are suppressing scientific knowledge about how valuable marijuana will be to “curing cancer.” Bring evidence, first by understanding what is cancer. Koppel BS, Brust JCM, Fife T, Bronstein J, Youssof S, Gronseth G, Gloss D. Systematic review: Efficacy and safety ofmedical marijuana in selected neurologic disorders: Report of the Guideline Development Subcommittee of the American Academy of Neurology. Neurology 2014;82:1556–1563. Melamede R. Cannabis and tobacco smoke are not equally carcinogenic. Harm Reduct J. 2005 Oct 18;2:21. PubMed PMID: 16232311; PubMed Central PMCID: PMC1277837. Pacey AA, Povey AC, Clyma JA, McNamee R, Moore HD, Baillie H, Cherry NM; Participating Centres of Chaps-UK. Modifiable and non-modifiable risk factors for poor sperm morphology. Hum Reprod. 2014 Aug;29(8):1629-36. doi: 10.1093/humrep/deu116. Epub 2014 Jun 4. PubMed PMID: 24899128.